A lot has happened during Kachina Chapter 28’s history. In the early years from 1956 to 1957, Arizona Chapter 28, Crosby Holden served as the first chapter president. During the next several years, the Arizona Chapter 28 developed a set of by-laws under Garth J. Linkey who served as President during 1958-59 and also as International Right of Way President during 1968-69. At that time, Arizona’s population was approximately 1,300,000 and the city of Phoenix was approximately 439,000. Gasoline was sold for $0.30 per gallon. The Arizona Chapter 28 grew tremendously with the growth of Arizona and the Phoenix Metropolitan area. Notable projects in which Arizona Chapter 28’s right of way professional members participated included the Central Arizona Project, completion of final leg of I-10 Freeway of Federal Highway Interstate System, Arizona Canal Diversion Channel Flood Control Project, and the Valley Metro Light Rail System.Countless other major roadway, utility, and relocation projects were supported with chapter members. Currently, Arizona Chapter 28 is known as the Kachina Chapter 28. Our membership has included one International President, Region Chair and Vice-Chairs, international committee region representatives and at large members, Balfour Finalist, and 85 SR/WA’s - one of the chapters with the highest number of SR/WA members. Ann Ortega served as the first woman president for Kachina Chapter 28 in 1976 and to date thirteen women have served as Kachina Chapter 28 President. For years, the chapter membership has been over 200 members. 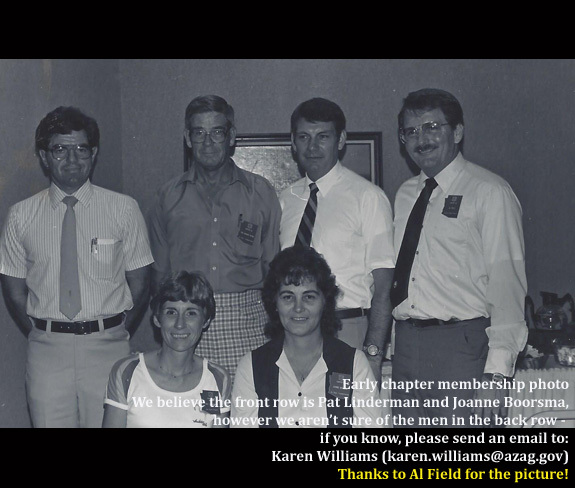 Our chapter was one of the first to develop a web site and assist with the development of Region One’s web site.